New year, old movies. What else? 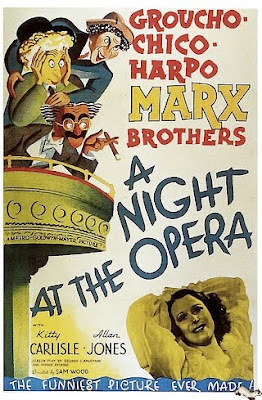 This is probably my favourite Marx Brothers outing. Duck Soup (1933) may have more to say but perhaps in the final analysis its satirical targets are too broad and its underlying message too grave to permit the sort of joyous, carefree abandon peddled in A Night At The Opera. Don't get me wrong, Duck Soup is home to some of the finest anti-war dialogue ever uttered (Groucho: "Remember, while you're out there risking life and limb through shot and shell, we'll be in here thinking what a sucker you are"). It also has the added benefits of a very game Louis Calhern and Margaret Dumont plus the extraordinary Raquel Torres, a kind of Hispanic Betty Boop brought to life. And even though it's not as heavy-handed as The Great Dictator (1940) or as bleak as Dr Strangelove (1964), a world in which dictators go to war because someone called them "an upstart" or because they've already paid a month's rent on the battlefield strikes me as too close for comfort in a world of fictionalised weapons of mass destruction and dodgy dossiers. A Night At The Opera doesn't begin to concern itself with anything so weighty. Instead, the Brothers combine to form a kind of anarchic moral tornado, devastating and ridiculing anything in their path that smacks of pomposity, cruelty or injustice. Their principle targets here are wet-blanket tenor Rodolfo Lassparri (Walter Woolf King) and the snobbish Herman Gottlieb (Sig Ruman), the touring opera company's financier, who are conspiring against simpering young lovers Allan Jones and Kitty Carlisle. Highlights include Groucho and Chico tearing the legal profession apart clause by clause and the famous stateroom scene in which the Brothers see how many people they can cram into a crowded ship's cabin - a setpiece that has continued to provide the inspiration for student pranksters the world over ever since. Variations involving Mini Coopers and telephone booths remain popular to this day. Another very fine scene is this definitive example of Chico's piano playing, a unique comic style he developed entirely by himself. The tune is 'All I Do is Dream of You' by Nacio Herb Brown and Arthur Freed, which was also sung by Debbie Reynolds and a chorus of bathing beauties in Singin' In The Rain (1952). A Night At The Opera marked the end for the often redundant Zeppo as well as the Brothers' transfer from Paramount to MGM and into the hands of Boy Wonder producer Irving Thalberg, the inspiration for F. Scott Fitzgerald's Monroe Stahr who would die tragically just two years later from pneumonia aged 37. Thalberg met Chico (a chronic gambler) at a poker game where he overheard the comedian complaining that the Marxes were all washed up. The producer disagreed and felt they had simply been mismanaged by their previous employers. Later, the wunderkind bet Groucho that he could make a picture with the Brothers containing only half as many laughs as Duck Soup and still make twice as much money. Having signed them and endured their relentless practical joking on set, Thalberg's innovations turned out to include bringing back playwrights George S. Kaufman and Morrie Ryskind, veterans of The Cocoanuts (1929) and Animal Crackers (1930), to shape the story (as well as uncredited gag specialists Al Boasberg and a certain Buster Keaton) and sending the Brothers back out on the road to rediscover their vaudeville roots. This proved an inspired call. Testing out new material in front of live theatre audiences helped revitalise the Marxes' whole act and the resulting films with Sam Wood at the helm, this and the patchier A Day At The Races (1936), are all the fresher for it (in spite of their intense dislike for Wood). There is real confidence in these tried-and-tested routines. Another problem with Duck Soup that is avoided here is in the staging. Freedonia's Art Deco interiors feel rushed, ill-defined and ultimately unreal. Its government buildings, court rooms and lawns are vague and interchangeable unlike, say, the similar but more distinctive big white Venice sets used in Fred Astaire's Top Hat (1935). The ship, hotel and opera house here though all serve to contain the Brothers within a stuffy real-world context of privilege and propriety, an atmosphere that provides the ideal backdrop for their zany brand of anti-establishment capering. Not everyone agrees though. Groucho's biographer Stefan Kanfer complains of A Night At The Opera that, "Instead of making sport of romance, they facilitated it. Instead of whacking away at the powerful institutions of government or the military or education, they battled the toothless enemy of grand opera... They were not outrageous any more, they were only frivolous; they were not surreal, they were only foolish; they were not daring, they were only impolite." Maybe so, but A Night At The Opera is still a rollicking good ride at the expense of snide self-importance, a worthy target if ever there was one. Great review once again Joe. Always happy to know someone who ranks A Night at the Opera higher than Duck Soup.